When it comes to capturing big data to track and market your future business, Konnection software allows you to use a variety of collected data from your plant floor to make decisions for your business. Imagine being able to use PLC, equipment, process and ERP/MRP data to see past trends and analyze root cause and energy use over your entire process. Production data is key to making sure your system is efficient and profitable. Konnection software turns your data into easy to read graphs detailing the information you have in a reviewable database created by your real-time production. This allows you to monitor production like never before. Recognize trends, view your total number of jobs and carriers, maximize shift productivity and track unproductive aspects of your floor. Process tracking allows your company to ensure quality of your work and provides your operators detailed work instructions, the ability to compare shift reports and closely monitor energy and resource usage. Ensure that your parts went through the finishing system in the same amount of time every time. Use our software to check coating times, or when carriers entered and exited the system. With this information you can answer questions about what’s happening at every point in your process. With Konnection software, you’ll know everything about the process — even down to if your operator held or released the carrier within the allotted time. Production data is key to making sure your system is efficient and profitable. Konnection software turns your data into easy to read graphs detailing the information you have in a reviewable database created by your real-time production. Tracking your parts is essential to making sure you are getting the most out of your process, and ultimately your business. 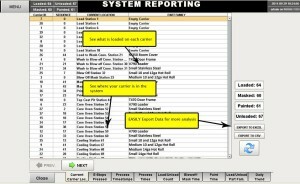 With this level of system reporting, you can easily locate parts in the finishing system, and have their data accessible at a later date via serial numbers. An overview screen gives a visual representation of your stations and are color coded for quick detection for status review. You can see what is loaded on each carrier, where that carrier is in your system and then quickly export the selected data via spreadsheets or .csv files. Data can also be filtered by any field, allowing you to look at the production of a single part over a month or at all parts produced in a day. Our Konnection software connects to your factory floor to your upper level software like SAP and your ERP seamlessly with the format of the data translated to read E-Net, DeviceNet, ProfiBus, ModBus, Serial and many more. The core of our software is SQL server that utilizes redundant servers, and is capable of using your existing hardware. This web-based software is visible from mobile devices and can even send text messages and alarms fault to the screens. For more information on how you can maximize your plant floor, contact IntelliFinishing with your request for Konnection software.